It is with great surprise and inner peace that we write about the sudden upward journey that beloved Betty Salmon has made as the result of a car accident not of her making. Let us picture her with a musical gait, walking in the morning air to the tune of composer Ralph Vaughan Williams laughing and smelling flowers. We see her happy face along a mountainside path overlooking the beautiful flower gardens at the base of Table Mountain, or walking and singing along the still, azure blue ocean off Fishhoek, Cape Town, where she lived. Wherever Betty was—was the music of the soul! Betty herself was a composer of songs, hymns and ballads. 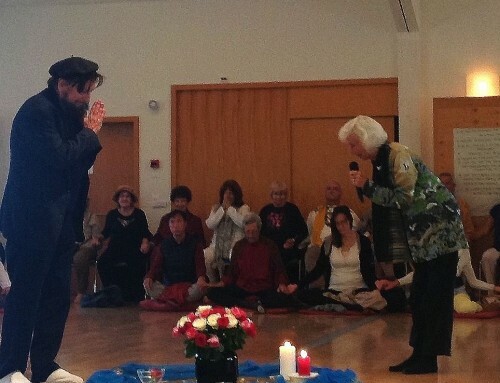 She graced our European seminars many times with her visits to Austria, Germany and Switzerland, where she would orchestrate to hundreds of congress attendees with her near-perfect pitch on the sacred mantras. We remember singing with her in the strong breeze blowing on top of Table Mountain; we remember singing with her in the mountain heights of Austria overlooking the city of Feldkirch where we would have many of our Pentecost Congresses; we remember singing with her in the auditorium of the Technical University in Budapest, Hungary, when the delegates suddenly came to life with the tempest of our strong voices singing together! In fact, some of her last thoughts were that she would miss being with us. Wherever we look we shall miss her voice–at the Academy’s center in Johannesburg, at conferences in Dornbirn, in Helsinki, in Strassburg, in Berlin, and even singing in the car going to and from the Munich Airport. She rarely tired of her long travels to Europe from the tip of South Africa. The Knowledge of the eternal soul allows us to wipe our tears with happiness! Betty knew and lived her mission. She knew that music was the key to overcoming the challenges that threaten personal security, social change and just plain relationships that has threatened many in South Africa and Europe. We talked about the music of compassion and the need for more teaching on the inner peace work with the Divine Mother that cuts through every layer of society. The deep music of compassion brings the music of companionship into the realization of the vibratory power of souls that sing to one another. We often spoke about the music that brought out higher creativity or the Overself as a gift to life. If there is one essential characteristic or element most needed to ensure the success of those who seek the immortal Overself, it is the vibration of self-honesty. Without true integrity–from inside out–it is impossible for the seeker to come into a conscious, living relationship with the Divinity within which is needed for an understanding of the greater path of Life. Betty, at over ninety years of age, was never old. At the same time she exemplifies our new book on the Seventy-Two Names … of the Divine Mother that opens another level of unity work with the Divine feminine which she exemplified. Now it will be up to each one of us to prepare others to learn and use these Names effectively and to gain inner power needed to overcome unsettling scenarios as Betty did. From being a nurse during WW2 in Britain to leading The Academy, Keys groups in the Cape, she always emanated a Higher Love for everyone. —let us open our ears to a great music teacher and, listen. If we listen clearly with our hearts we can still hear her teaching and singing from the Heavens! I feel that I have written and spoken so much about you over the last couple of days… of your love, gifts and time that has been shared not only to me but so many, through your song, your art, your deep driving desire to awaken the heart and mind to the memory of our Divine Truth and the Truth of Things. Thank you for challenging me, confiding in me, believing in me and helping me to see a beauty and a strength in me. That is a gift of Love that has found good ground to grow and to blossom. All of “Europe” in the beloved Academy Fellowship worldwide is praying for you and singing for you, just as you have always sung for us. Your humility and yet your total uprightness at all times have touched and taught us most. 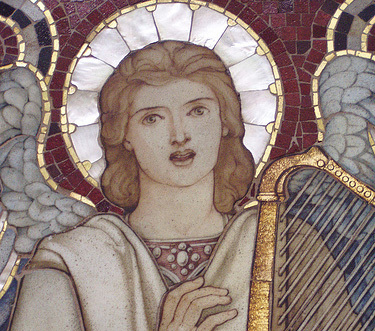 May you now receive your rightful place among the eternal singers and musicians in the Heavenly Temple. Thank you for honouring my mother in this way. Your words are of great comfort and will guide me in my way forward. I am very grateful for you and all the Academy members who have blessed my mother’s life. Her interaction with all of you brought her so much joy. She was truly a very special and very unique person, of great integrity, a wonderful challenging mother and friend who loved unconditionally. I too have seen you in my mind’s eye, smiling, laughing, dancing and singing, to the delight of those on ‘the other side’. I know you are at peace and that you carry on bringing Light to those around you. Thank you for taking me into your group when I arrived in Cape Town. You taught me a great deal about the importance of music, music, music! I fondly remember you teaching me the songs and the dances. As Ulli says, “We are going home….” and I sense now that you are Home – with many of your Beloveds, with the Music of The Spheres, with The Orders of Light. You were an amazing and inspiring person to be around. Always on the go, very active in mind, body and spirit, and you never appeared to be your age, which I loved. I will never forget you telling me your story. To come on a boat from England in those days was quite something! I grew very fond of you Betty. I love you dearly and will miss you. Rest now in the Company of The Higher Heavens. Dearest Betty you gave me one of my most treasured experiences of my life. You place me on the greater path to God. You blew my mind and sent my spirit soaring when you played the didgerdoo up my spine and I didn’t come down to earth for a many weeks afterwards. For that and all the smiles and words of encouragement for everything that you do and all of that and more I thank you. Our beloved Betty- Mentor, teacher, confidant, counsellor and friend. You were our inspiration. We sang and danced, we laughed and cried but we continued to learn and lift our consciousness and understand the higher knowledge and teachings. To see God’s word in a different light. You kept challenging us to go deeper. You inspired us with your art, your music and voice and certainly by your energy. But more importantly, your love. You taught us not to give up, Not to dwell in the negative but to live in the light and be the light. Age was just a number. I know that you are ok. You are singing and dancing with the angels. We will love and miss you forever. I am eternally grateful to have been blessed and honoured by you when you took me in as your student. You have marched home in the light. Go well.